The Santa Clara County District Attorney's Office has determined that the fatal shooting of an unarmed robbery suspect and alleged gang member by a San Jose police officer in 2017 was legal and no charges will be filed, prosecutors said Monday. Officer Michael Pina shot 33-year-old Jacob Dominguez on Sept. 15, 2017, with an AR-15 rifle after Dominguez, who was sitting in the driver's seat of a rented car, made a "furtive move," according to prosecutors who reviewed the case. Pina and his fellow officers had stopped the car near the intersection of Penitencia Creek and North White roads at about 7 p.m. and were trying to arrest Dominguez, who had eluded a police pursuit earlier in the day. About 50 seconds later, after Dominguez leaned forward in his seat and lowered his hands, Pina fired two shots, one of which struck Dominguez in the head, according to the district attorney's report on the shooting released Monday. "Based on the evidence reviewed in this case, Officer (Michael) Pina actually and reasonably believed that he needed to use deadly force to protect himself and others when Dominguez, a known violent gang member, ignored explicit and repeated commands at gunpoint to keep his hands up, and decided to drop his hands out of view," prosecutor Rob Baker, who authored the report, said in a news release. Police also say that just prior to the fatal shot, Dominguez cursed at officers and said, "F--- you. Shoot me, b----." An autopsy report shows that the shot that killed Dominguez entered the left corner of his mouth. "The projectile caused a fatal hemorrhagic injury, traveling across his body in a downward trajectory through his jaw bone, tongue, and the soft neck tissue before becoming lodged internally against his spine," according to the report. A toxicology report showed that Dominguez had methamphetamine and PCP in his system when he died. No gun was found in Dominguez's car, but police did discover a closed folding knife under a backpack on the front passenger seat and a bag of methamphetamine in the center console, according to the report. Dominguez, who had several run-ins with police and spent time in prison for a 2004 armed robbery conviction, was wanted in connection with the armed robbery of a gas station six days prior to his death. 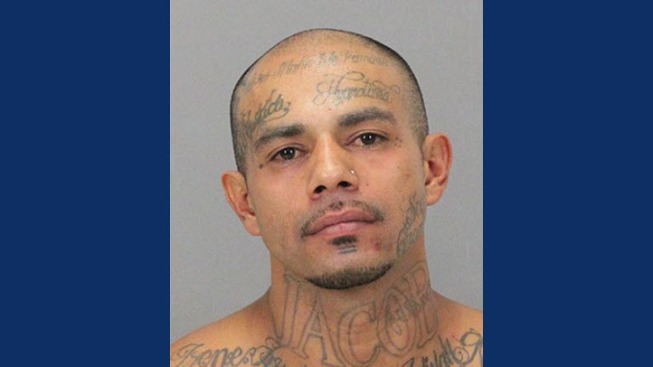 One of his alleged accomplices in that crime, Andrew Anchondo, was arrested and eventually convicted on robbery changes with gang and firearms enhancements, and was sentenced to 13 years in prison, according to Santa Clara County Assistant District Attorney Brian Welch.